Roy Huggins has been writing professionally since 2010. Huggins received his Master of Science in counseling from Portland State University in 2007 and is now a counselor in private practice in Portland, Oregon. He also has certifications in neuro-linguistic programming and Japanese language proficiency. Van Houtte is a North American coffee roastery and retailer that produces a variety of regular and flavored coffees such as the French Vanilla flavor. It is available in bags or in single-serving pre-packaged cups called "K-Cups." One K-Cup of Van Houtte French Vanilla coffee has two calories. None of the calories are from fat or carbohydrates. Compare it with a typical 8-oz. cup of regular black coffee as defined by the USDA, which also has two calories without significant fat or carbohydrate content. Brewed black coffee is very low in calories and is devoid of fat and sugar. Most calories in coffee drinks come from added items such as cream and sugar, says nutritionist Katherine Zeratsky of MayoClinic.com. Based on the comparison to standard black coffee, Van Houtte Cafe's flavoring process does not seem to add calories to the original coffee beans. 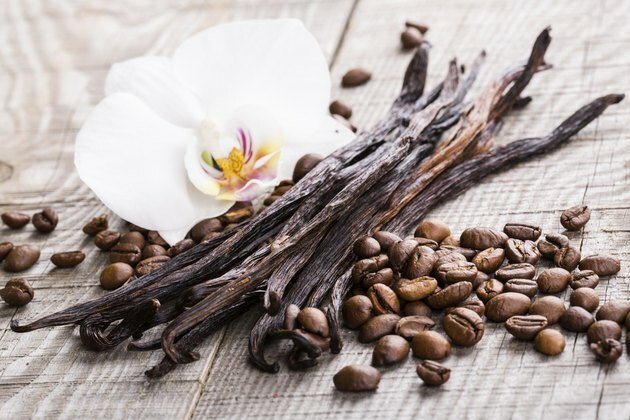 Since calories in coffee mostly come from items that are meant to add to the flavor of it, the French vanilla flavoring of this coffee may reduce your need to add caloric condiments in order to enjoy it. Be aware, however, that regular coffee is high in caffeine. So drink in moderation.